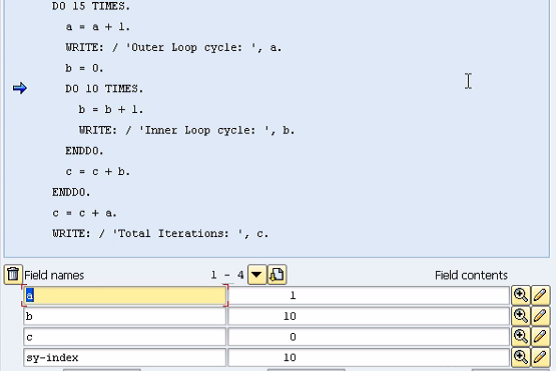 DO loops can also be nested. 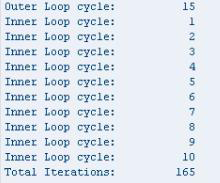 If this is done, each nested loop will have its own sy-index created and monitored by the system. Be aware that when nesting many loops, it is im-portant to consider how much work the system is being asked to do. While the SAP system will certainly be able to handle this instantly, you should bear in mind that if this number was significantly larger and included more intensive processing than simple counting, this could take much longer. Set a breakpoint and execute this code in debug mode, keeping an eye on the values of a, b, c and sy-index in the Fields mode. As the DO loop is entered, the sy-index field will be-gin counting. 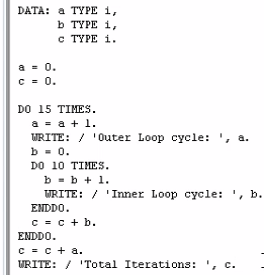 Here, the inner loop has just occurred for the 10th time, noted by the 10 in sy-index (and indeed the value of ‘b’). A very helpful article for everyone. Good work. There are different modules for different enterprises depending on nature and size of the business. Your Blog is nice and informative with excellent content..keep sharing your amazing post.. Your Blog is really useful for me,thanks for sharing your amazing post. Your Blog is very awesome with useful information.keep updating such an wonderful post with us.. I am happy to read your blog,its really useful for me,thanks for sharing this wonderful post. Hi,i found lot of information from your blog,its really useful for me.Thanks for sharing.. Thank you so much for sharing such an amazing post with informative information with us. It’s helpful for everyone. Keep updating such a wonderful blog. This information is good that you shared this helpful information with us. Please keep updating like this. Thanks for taking this opportunity to discuss this.I appreciate with this and if you have some more information please share it with us. I feel really happy to have seen your web page and look forward to so many more entertaining times reading here. Thanks once more for all the details. Thanks for providing wonderful information with us. Thank you so much. do post more blogs like this.